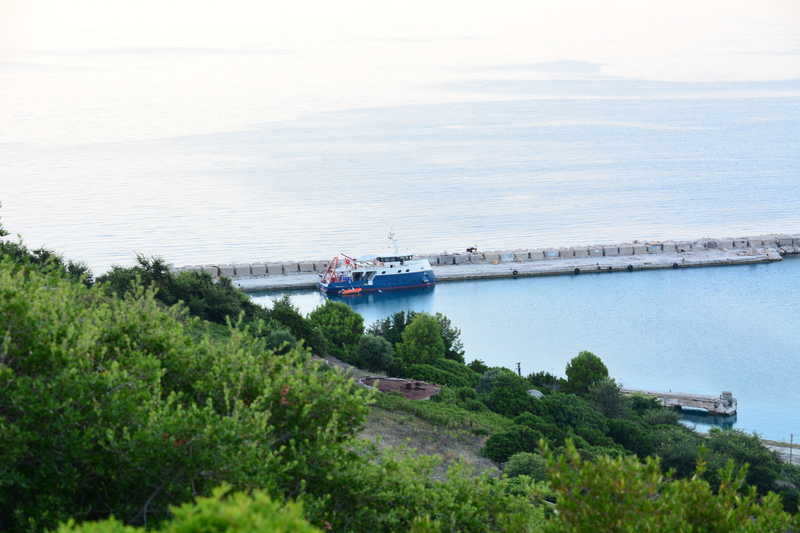 After the initial week of survey off the coast of Butrint, Virazon II transited to Sazan Island, located about 10 NM off the Albanian coast near the city of Vlore. The island is a former Soviet military installation that remains a restricted area. 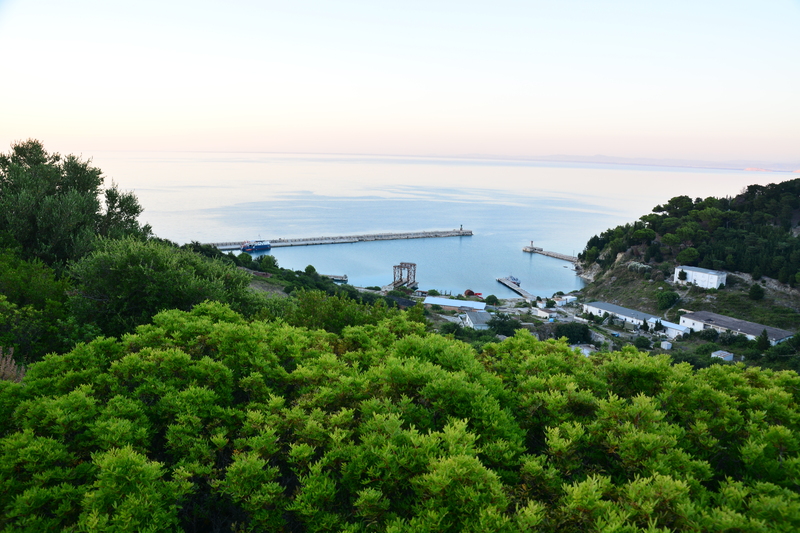 Permission to moor overnight at the naval pier was granted thanks to the efforts of Auron Tare, the General Director of the Albanian National Coastline Agency. 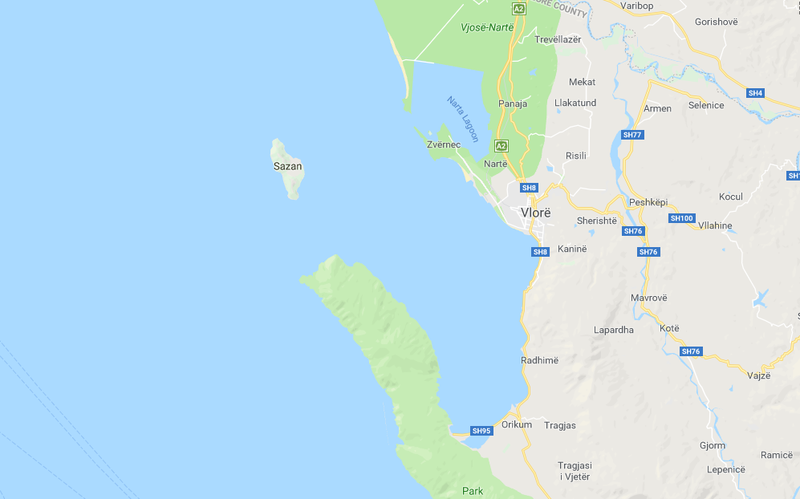 Having Virazon II moored at Sazan Island harbor provided excellent access to the wreck site, which is less than a kilometer from where the ship was docked. Intriguingly, despite being a restricted area, the island’s pebble beaches and abandoned buildings also serve as a tourist destination. Twice a day, boatloads of tourists would disembark with their strollers and coolers for a couple hours of family fun. In permanent residence on the island are two dogs and two donkeys. 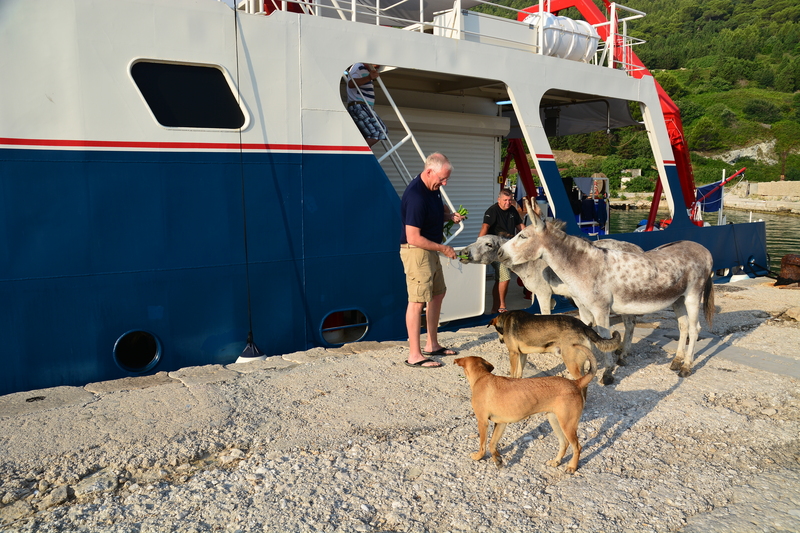 One morning, we discovered our curious animal residents just off the stern deck; Co-PI Dave Ruff generously offered them treats. With the Viosa river discharging to the north of Sazan, the visibility on site was generally quite poor. Despite this obstacle, the archaeological dive team was able to locate the wreck, which lies at a depth of 30 meters, and successfully complete multiple working dives on site. 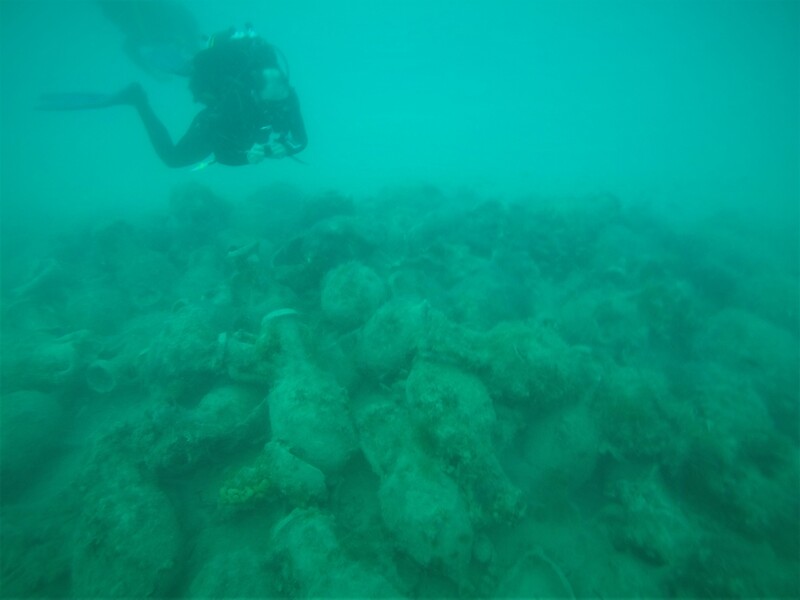 The Sazan Island wreck consists of hundreds of mostly intact Lamboglia 2 amphoras, in at least two, perhaps three, layers. The boundaries of the site are well-defined, with only a few amphoras scattered within a couple meters of the main pile. The amphora pile was measured at approximately 18.5 meters in length and 7.5 meters in width. While the top layer of the site appears to be primarily a homogeneous assemblage of Lamboglia 2 amphoras, a few anomalous finds were also noted, including possible fine ware pottery, some amphoras of disparate types, and a couple flat rectangular slabs that may indicate a secondary cargo of tiles. We had fair visibility on two of the dives and used those opportunities to take as many pictures as possible – these photos were assembled together in a computer program to generate a three-dimensional scaled model of the site. 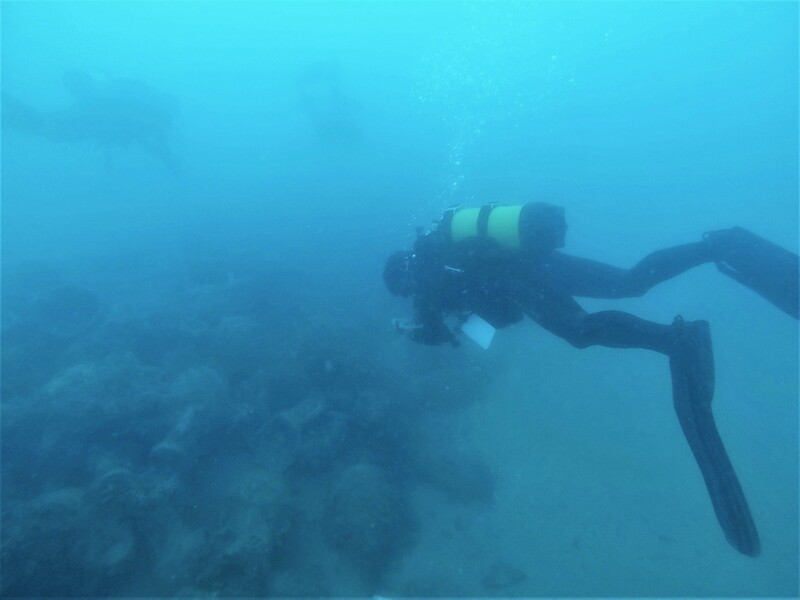 The following week, Virazon II traveled south to the Joni site, a fourth-century CE wreck located by RPM Nautical. During our transit to the new site, we picked up Dr. Neritan Ceka, a pioneer of Albanian underwater archaeology as well as the former Albanian Minister of Internal Affairs. We are honored to have him on board with us for a week while we assess the Joni wreck.